Someone asked me a little while ago, ‘how far could you ride?’ I said, ‘that depends… are we talking mountain or road bike?’. ‘Road bike, in one day’, they replied. I thought about it, and admitted even tough I’d done a couple 100 mile rides before, I didn’t really know… But suddenly, I was thinking about how to find out. Distance, or ‘enduro’ cycling can take different forms: road, mountain, fatbike, single-speed, paved, gravel, singletrack, prairies, or mountains, group ride or solo, single-day or multi-day… There are lots of possibilities, so I decided to keep mine simple and planned for a single-day (sunrise to sunset), solo, road bike ride in the mountains, along the Jasper to Lake Louise Icefields Parkway. Steadily over my mountain biking career, I’ve slowly upgraded the quality of bike I ride. I started with a Cannondale M800. With full LX, it was a good entry-level XC race bike, with no suspension at all – full rigid baby, and if I recall it retailed new for $2,200. Then I went and got a Jamis Expert XC, which had full suspension, and the XT/LX kit treated me well for two solid seasons. This rig retailed new for around $3,500. The summer of the Transrockies, I took Ken’s Specialized Epic Marathon off his hands and learned what it’s like to ride a true high-end XC bike. Full SRAM XO. Full FOX suspension, with the ‘Brain’. 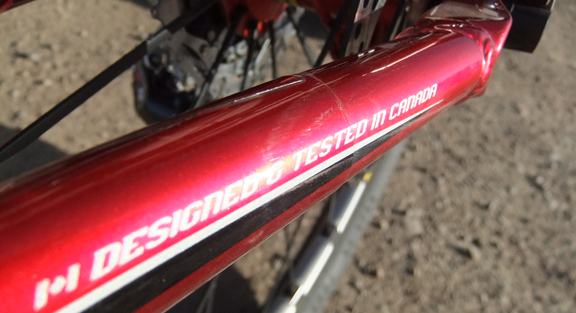 This bike was light, fast, responsive – it’s an XC machine that retailed new for $5,500. Now, I’ve upgraded one more time to a 2009 Rocky Mountain Element 90. Every now and then, Ken will say something that makes sense. It’s not that often though, so I wanted to be sure that I marked this very ‘rare’ occasion.